Ole Miss Mom: Fun in the Rain! There's been a nice change in weather these days! Finally. And a lot more rain - which we aren't used to these past few weeks! 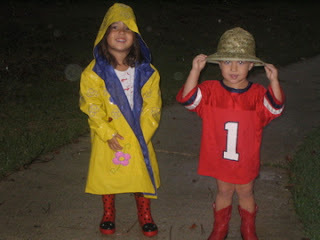 My kids, at the first drop of rain, want to put their boots and raincoats on and go outside! So, this time, I let them! They are already in the pjs because they had just had a bath! I just thought this was so cute because Landon doesn't have raincoat yet so he found a safari hat to keep him dry! And for rain boots he used his red cowboy boots! I'm looking forward to this weekend! We have a couple of kids birthday parties - always fun. And, drum roll please..................I get a girls night out!!!!! On of my friends since high school is tying the know and her lingerie shower is this weekend! It's been a year since I've been able to enjoy one of these nights because, well, I've been pregnant or tending to a newborn for the last 12 months!!! And as she would say, I've been pregnant for the last 4 years! I'm so excited, I don't ask for many nights away from my family - really because I'd rather spend my free time with them. But, I can't wait for some grown up girlie conversation! And I love any party that has to do with weddings! Whether it be an engagement party or bachelorette party! I just can't wait to cut loose and have fun with the ladies! :-) And not having to rush back to a babysitter that is burning a hole in your wallet is nice too! Robert is OH SO KIND to keep the kids! (THANKS BABE) I just hope he doesn't lose one of them! I'm sure he'll be GREAT but it's definitely harder when there are 3 of them and only 1 of you! You have to play "zones" at this stage in the game! Well, one picture of Lillian! She is just so sweet! 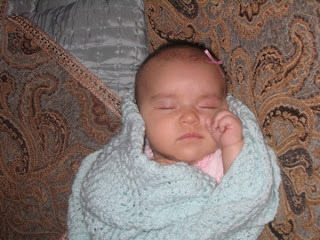 I wish she could stay this age forever! She is starting to laugh and really respond to us and she smiles with her mouth WIDE open! And her eyes just light up! So cute! She's just been a wonderful baby! Looks like fun! I visited Robert's blog. I enjoyed the read! He really has a knack for this!! I am praying for a paint job to come your way!!!! I can relate to Murphy invading our world a time or two! You are always so edifying when you speak of me. You are aware that lying is a sin, right? Just kidding. It is very encouraging. Thank you. I love you.